We are the only office in Springfield currently offering Spinal Decompression technology. Originally developed in the 1990's, Spinal Decompression is quickly becoming the best conservative treatment option for many patients suffering the effects of Disc herniations or Bulges of the neck and/or low back, Spinal Stenosis, Degenerative changes and radicular or referred pain patterns. 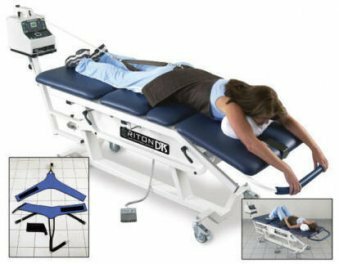 The process of Spinal decompression is so gentle, many patients actually fall asleep during the 12-18 minute treatment. This equipment is not appropriate for everyone. So it is important that if you or a loved one is suffering with any of the conditions mentioned above, that you have a brief consultation with Dr. Hecht to see if SPINAL DECOMPRESSION therapy is right for you.